On these pages I plan to put up a story about Lionel Leleux, one of the last of the great cajun fiddlers who died a couple of years ago. I was fortunate enough to meet him in 1990 and to have been able to visit him at his home on several occasions. I have some good pictures and some sound bytes off of a recording I made while there that I will be posting here. Lionel played with Lawrence Walker and with Joe Falcon back in the fifties. His early fiddling career began back in the twenties when he was in his teens but was interupted during the early part of his marriage until he was in his forties when his father-in-law asked him to play for some social occasion. In the meantime he cut hair for a living and perfected his fiddle making art at which he became a well known master. 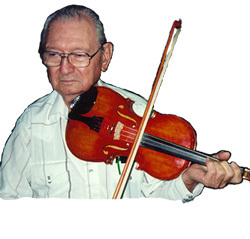 During his lifetime he constructed about 35 fiddles, most of them in the last ten years of his life. All of his fiddles display meticulous craftsmanship and sound wonderful. I wish that I had been able to obtain one myself. However, what I did obtain was a much deeper appreciation of Cajun culture and the spirit behind it that resided in this man's life.